Waking up, I usually check Facebook and Instagram for updates and posts from the night before. At breakfast, I take notes as needed – for work, for my blog, for ideas. I love writing with my fountain pens early in the day. I hope this doesn’t happen to me! But if it does… I’d like to bring an interesting pen. I’ll be happy to bring a Conklin Mark Twain Demo with a stub nib – it’s an excellent pen to write with, and an amusement at the same time, seeing the ink inside the barrel. I’m a huge fan of blue inks, so I’ll probably take a bottle of Stipula Calamo Deep Blue. My number one pen inspiration is Professor Butch Dalisay, our Philippines fountain pen group’s founding father. Professor Dalisay guides us in our choice of pens, and he shares his knowledge of pens and experiences with all of us generously. He has a collection of vintage Parker Vacumatics, but also uses modern fountain pens. An entry level fountain pen was gifted to me back in 2007. 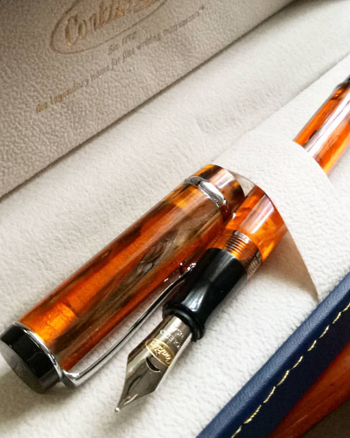 After reading about fountain pens and the fountain pen group here in the Philippines in Professor Butch Dalisay’s column, I met a fountain pen collector from Malaysia who showed me his Conklin Crescent Filler fountain pen. My interest in fountain pens got more intense after that and I started full fountain pen use that year. My first fountain pen memory is from when I was in first grade. I was preparing for a quiz bee and watching the news on TV. My eldest aunt let me use her fountain pen to write notes then. I don’t know what pen it was, but I remember it was a red pen with black ink. I really don’t know. I may have almost a hundred pens and close to 200 bottles of fountain pen ink. 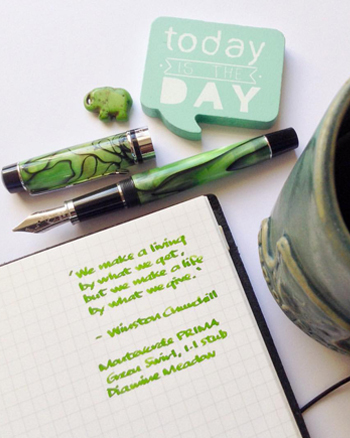 I love my Conklin Duragraph Amber, and lately I’ve wanted to try the Monteverde USA Gemstone Ink Collection. The Sapphire and Olivine are so beautiful to look at! Conklin Mandarin Orange in my Conklin Duragraph Amber. My taste buds crave coffee, but my tummy can only take tea nowadays. I still sneak in some coffee during the weekends. I’ll go journaling anytime, although I can do italic calligraphy well. I love writing about my day, how I feel, or about an idea. Words come to me flawlessly. Calligraphy, on the other hand, is something I do that needs my full concentration. I still do it at times, but not as often as journaling. Be kind. Nothing beats kindness in this world. I’d like to dream that I could get a Zeus Deluxe fountain pen, but realistically, I’m looking at a Monteverde USA Giant Sequoia in Blue with a broad or stub nib. Never use a new fountain pen without flushing it first, and never store a fountain pen without cleaning it first. 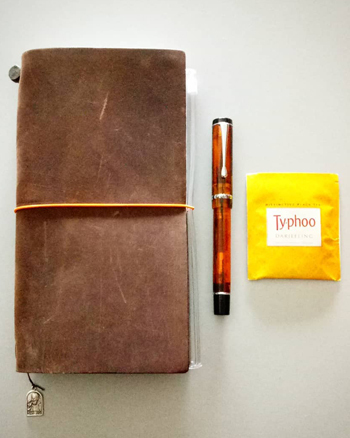 Place fountain pens in a pen wrap or portable pen case inside your bag to ensure they won’t leak, won’t break, and will last with you. Use a notebook to track the inks you use in your pens – I have a notebook where I always write the pen/ink combination whenever I ink a pen. Bright green because it’s hard to look at – to write with and to read later. Yes. I like to be an easy person. So I choose modern pens – they are easy to get (availability), easy to maintain (cleaning and replacement parts), and usually durable (ABS plastic, resin). No. I’m a person who plans almost everything. Signing a $10M deal doesn’t come to me as a spur-of-the-moment thing, it’s something planned and arranged beforehand. Having said that, if I will be signing a $10M deal, I’ll choose a favorite bright blue ink to go with my favorite classy pen.